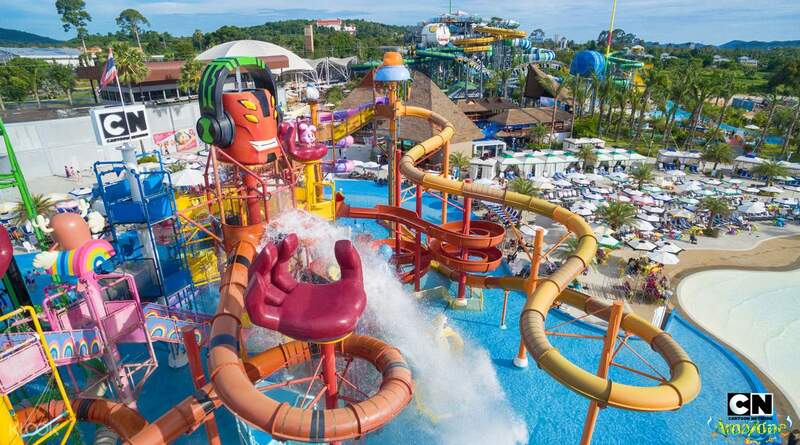 Find out the best rides in our Cartoon Network Amazone Water Park Pattaya Guide for maximum enjoyment! What an amazing water park has numerous sliders with a 3 to 5 levels height and long distance for sliding. Definitely the kids can play most of it and adults also does.enjoy the fun there. Reccomend to family and you shouldn't miss it. 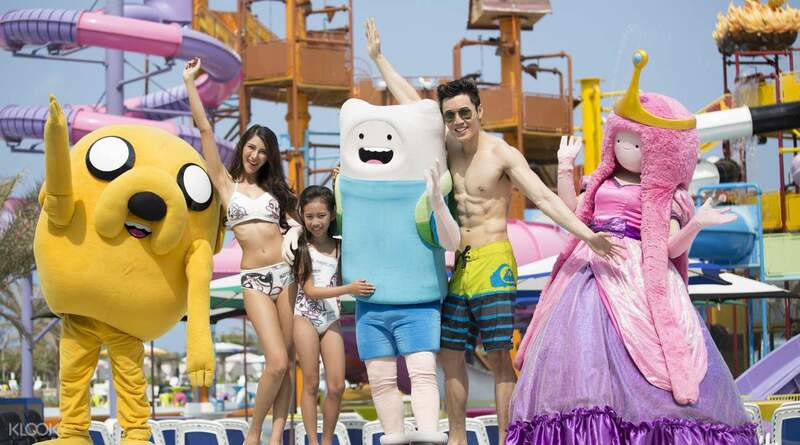 Cartoon Network Amazone Pattaya is the world's first Cartoon Network-themed waterpark. Based on the popular children's channel, this family-friendly water park is sure to excite thrill-seekers and animation fanatics alike! With the Cartoon Network Amazone ticket, you can splash out with all of your favorite Cartoon Network friends, including Adventure Time's Finn and Jake, The Powerpuff Girls, Johnny Bravo and many more. 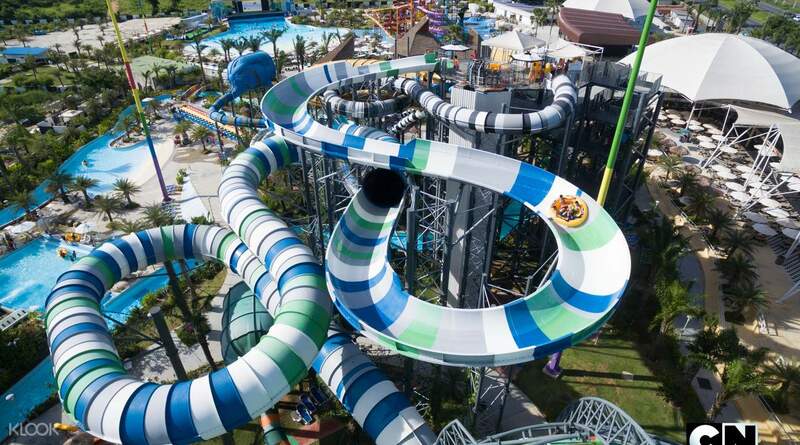 This unique park will have you free-falling 17 meters, hurtling to a splash landing from 23.4 meters, braving the Riptide Rapids, riding out the Mega Wave and exploring the splashtastic slides and fountains at the kids-only Cartoonival. 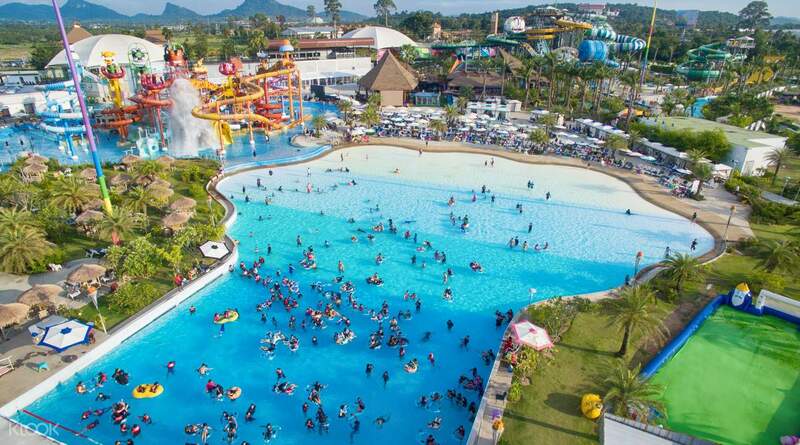 If you're looking for things to do with kids in Pattaya, the Cartoon Network Amazone waterpark should be high on your itinerary! My friend and I had a super fun day in the amusement park. We are 27 and 30 years old, respectively, and we love the pump of adrenaline but we do not need super scary rides to enjoy. The 'omniverse' world (Ben 10) and the adventure world provided just that. The slides were very exciting and caused our hearts to beat a bit faster. There was a selection between rides with a tube, a mat and without any gear. The best were with tubes. They were also the majority. We also tried the wave pool. It was cool, but rather calm for us. A more exciting activity was the fake surfing. I tried it a little bit, and after three tries I could get tho hang of it, and enjoy this unusual experience. For visitors with little kids, there is an additional world called cartoonival that can be of great fun for them. We came on Monday, which is not a busy day at all, and for all the rides except the two highest slides and the surfing experience, there was no lines at all. For the others we waited maximum 15 minutes. My friend sarcastically said that without waiting times we get tired much more faster because we do one slide after the other, no stop, and there are a lot of steps to climb each time. The food we ate was very good but expensive. Luckily, we had found good deals for it online the day before, the price became reasonable. Note that you cannot enter with your own food and beverages into the park (they check in your bags). We ate chicken burgers and fries that we enjoyed very much. Before leaving the park we finished off with a waffle and milkshake dessert in 'Dexter's laboratory'. This café looks awesome for a couple of geek-fans like us, and the food there was delicious. There were not so many activities with the characters, but there were many opportunities to take pictures with them. We spent about 7 hours in the park. Overall, it was a great day! My friend and I had a super fun day in the amusement park. We are 27 and 30 years old, respectively, and we love the pump of adrenaline but we do not need super scary rides to enjoy. The 'omniverse' world (Ben 10) and the adventure world provided just that. The slides were very exciting and caused our hearts to beat a bit faster. There was a selection between rides with a tube, a mat and without any gear. The best were with tubes. They were also the majority. We also tried the wave pool. It was cool, but rather calm for us. A more exciting activity was the fake surfing. I tried it a little bit, and after three tries I could get tho hang of it, and enjoy this unusual experience. For visitors with little kids, there is an additional world called cartoonival that can be of great fun for them. We came on Monday, which is not a busy day at all, and for all the rides except the two highest slides and the surfing experience, there was no lines at all. For the others we waited maximum 15 minutes. My friend sarcastically said that without waiting times we get tired much more faster because we do one slide after the other, no stop, and there are a lot of steps to climb each time. The food we ate was very good but expensive. Luckily, we had found good deals for it online the day before, the price became reasonable. Note that you cannot enter with your own food and beverages into the park (they check in your bags). We ate chicken burgers and fries that we enjoyed very much. Before leaving the park we finished off with a waffle and milkshake dessert in 'Dexter's laboratory'. This café looks awesome for a couple of geek-fans like us, and the food there was delicious. There were not so many activities with the characters, but there were many opportunities to take pictures with them. We spent about 7 hours in the park. Overall, it was a great day! Worth every penny! It's probably one of the cleanest, most fun waterparks in Asia that has rides and fun for all ages. You can do everything from relaxing under the sun to experiencing extreme adrenaline rush. The changing rooms were so clean and convenient. Worth every penny! It's probably one of the cleanest, most fun waterparks in Asia that has rides and fun for all ages. You can do everything from relaxing under the sun to experiencing extreme adrenaline rush. The changing rooms were so clean and convenient. Very cool water Park! I recommend to all! A huge area for children, delight! A lot of cool slides for adults. Excellent organization of space. Many cafes with reasonable prices. Price at klook just super! Much cheaper than the Park. Easily accessible by public transport for 20 batt. Very cool water Park! I recommend to all! A huge area for children, delight! A lot of cool slides for adults. Excellent organization of space. Many cafes with reasonable prices. Price at klook just super! Much cheaper than the Park. Easily accessible by public transport for 20 batt. amazing waterpark with lots of slides that are both safe and exhilarating. Come early when it opens at 10am so you can enjoy and beat the rush. The food at the park's restaurant was also surprisingly very tasty. Well worth the ticket price if you've bought through klook, the entrance procedure is very simple. amazing waterpark with lots of slides that are both safe and exhilarating. Come early when it opens at 10am so you can enjoy and beat the rush. The food at the park's restaurant was also surprisingly very tasty. Well worth the ticket price if you've bought through klook, the entrance procedure is very simple. It was an amazing experience to spend a fun-filled day in Cartoon Network water park in Pattaya. Great waterpark with everything you need for a day out with the kids. A bit overpriced when you walk-in ; but got on a great discounted price while booking via Klook app. The kids and adults will have a great day out. Highly recommended. 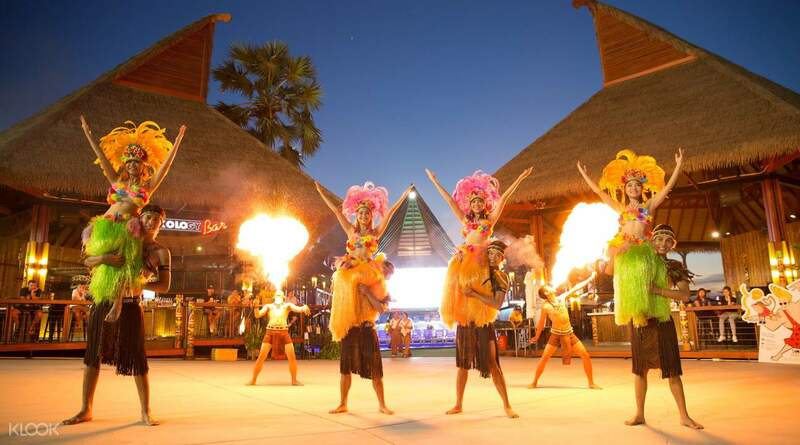 It was an amazing experience to spend a fun-filled day in Cartoon Network water park in Pattaya. Great waterpark with everything you need for a day out with the kids. A bit overpriced when you walk-in ; but got on a great discounted price while booking via Klook app. The kids and adults will have a great day out. Highly recommended. An absolutely amazing place for kids. we had so much fun with all the activities and the water slides. Only downside is some of the staff are lacking good customer service skills and can be very rude. An absolutely amazing place for kids. we had so much fun with all the activities and the water slides. Only downside is some of the staff are lacking good customer service skills and can be very rude. Me and my 7 year old daughter enjoyed one full day at the water park, there’s many ride to try on, you’ll not feel bored, it’s good place for thrill seekers. My daughter she love all the cartoon characters that she saw that day. Thank you to Klook for the discounted price that we have. Me and my 7 year old daughter enjoyed one full day at the water park, there’s many ride to try on, you’ll not feel bored, it’s good place for thrill seekers. My daughter she love all the cartoon characters that she saw that day. Thank you to Klook for the discounted price that we have.